A rich trove of marine geophysical data acquired in the search for the missing flight MH370 is yielding knowledge of ocean floor processes at a level of detail rare in the deep ocean. The tragic disappearance of Malaysia Airlines flight MH370 on 8 March 2014 led to a deep-ocean search effort of unprecedented scale and detail. Between June 2014 and June 2016, geophysical survey teams aboard ships used echo sounding techniques to create state-of-the-art maps of the seafloor topography and profiles of the sediments below the ocean floor in a zone spanning about 279 000 km2 of the south-eastern Indian Ocean. Fig. 1. 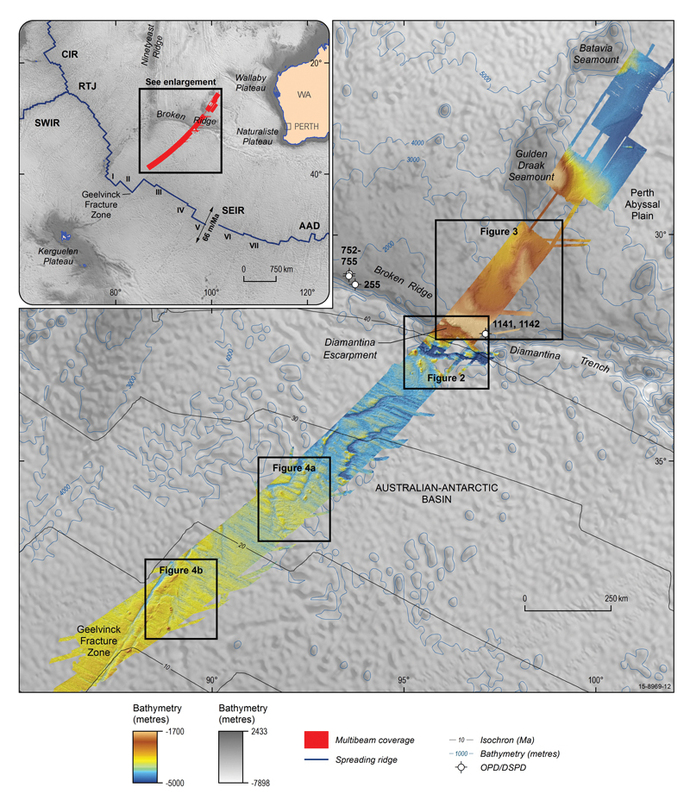 Satellite-derived gravity field (gray)  and multibeam echo sounder (colour) data were used to produce these maps of the MH370 search area in the southeast Indian Ocean. The relief models are shown in sun-illuminated (shaded relief) mode. The inset map shows the MH370 search area that was mapped with multibeam echo sounding (shown in red). This map highlights the Southeast Indian Ridge (SEIR) and the Kerguelen Plateau, and it includes estimated spreading rates of the SEIR , lines delineating regions of approximately equal age (isochrons), and interpretations of SEIR segments (I–VII ). Other abbreviations are AAD, Australian-Antarctic Discordance; CIR, Central Indian Ridge; RTJ, Rodriguez Triple Junction; SWIR, Southwest Indian Ridge; WA, Western Australia. 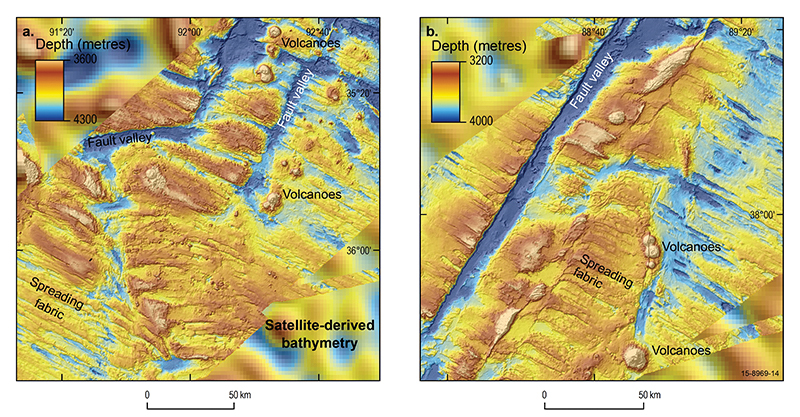 The larger map shows details of the ocean depth mapping effort using multibeam echo sounder bathymetry data. Locations of Deep Sea Drilling Project (Leg 26) and Ocean Drilling Program (Legs 121 and 183) Sites 255, 752 to 755, 1141, and 1142 are also indicated, as are the locations of Figs. 2, 3, and 4. The curved search swath is 75 to 160 km wide, and it sweeps from northeast to southwest. It centres on Broken Ridge and extends roughly 2500 km from the eastern flank of Batavia Seamount to the Geelvinck Fracture Zone (Fig. 1). Aircraft debris found along the shores of the western Indian Ocean is consistent with drift modelling that indicates the aircraft entered the sea in the search area. The data set that emerged from this search effort constitutes the largest high-resolution multibeam echo sounder (a type of sonar) mapping effort for the Indian Ocean, covering an area about the size of New Zealand. Previous ocean floor maps in this region had an average spatial resolution (pixel size) of more than 5 km2, but the new maps resolve features smaller than 0,01 km2 (an area slightly larger than a soccer field). Crucially, the new data provided the geospatial framework for the last phase of the search, in which search teams deployed deepwater, high-resolution acoustic and optical imaging instruments with the ability to identify aircraft wreckage. Fig. 2: Three-dimensional model looking east of the rifted southern flank of Broken Ridge (northern part of the rift valley) along the Diamantina Escarpment. Slopes commonly exceed 10°, and they increase to more than 35° along the margins of the Diamantina Trench. 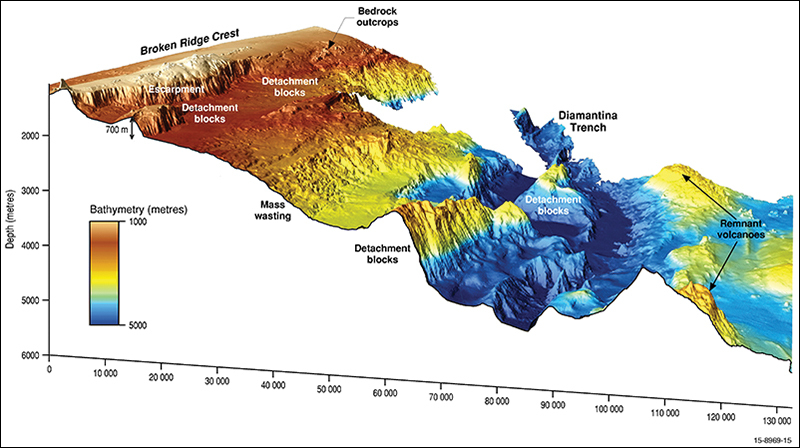 Large-scale ocean floor features include escarpments (as much as 1200 m high), detachment blocks, grabens, and areas of planar floor within the trench as wide as 10 km. High backscatter intensity and angular morphology indicate that bedrock is exposed in a few places at and near the top of the ridge and on the flank down to depths of about 1350 m. Parallel WSW–ENE lineations on some scarps, extending to water depths of about 2400 m, most likely represent exposed, steeply-dipping bedding planes. Mass wasting, a downslope movement of loose rocks and sediment during and after the rifting process, has incised the escarpment, and significant sediment has accumulated in the grabens and at the bottom of the Diamantina Trench (see Fig. 1 for location). The global ocean covers 71% of Earth’s surface, yet the ocean floor remains poorly studied compared to the land surface. In particular, knowledge of ocean floor topography is sparse because light cannot penetrate the deep ocean and acoustic mapping techniques are relatively inefficient in mapping its floor. Most of the ocean floor (85% to 90%) has been mapped indirectly using satellite-derived gravity data, which yield a spatial resolution of about 5 km . By comparison, topographic maps of even the most remote land areas on Earth resolve features approximately 50 m across, and topographic maps of the Moon, Mars, and Venus resolve 100 m features . The high-resolution multibeam echo sounder data set that emerged from this search effort covered an area about the size of New Zealand. Ship-mounted multibeam echo sounders that use sound waves that echo off the ocean floor provide much finer and more accurate topographic data for the deep ocean floor with a spatial resolution (as distinct from a vertical resolution) of at least 100 m in 5000 m water depths. However, only 10% to 15% of the ocean basins have been mapped using multibeam echo sounders . This technique also records acoustic backscatter from the ocean floor, which can be used to distinguish between hard rock and soft sediment. Such fundamental spatial information is essential for characterising the physical features of the ocean floor, for making inferences on geological and oceanographic processes, and for identifying the habitats of species that live on the ocean floor. Fig. 3: The differences in resolution between multibeam and satellite-derived bathymetry data for the northern flank of Broken Ridge are apparent here. Numerous mass wasting features are evident, including slides and debris flows (delineated by their head scarps) that crosscut and run out as debris fans into the large semicircular depression (see Fig. 1 for location). Beyond the continental margins, toward the open sea, the floor of the Indian Ocean is a complex mosaic of normal oceanic crust (not associated with hot spots and other anomalies), submarine plateaus and ridges, seamounts, sea knolls, and microcontinents. Various processes, including seafloor spreading (including ridge jumps), flood and hot spot magmatism, and tectonism, produce a variety of features. Only 10% to 15% of the ocean basins have been mapped using multibeam echo sounders. The MH370 search area includes all of the major elements of the mosaic, and it lies in water depths between 635 and 6300 m (Fig. 1). The search teams mapped most of the area with a 30 kHz multibeam echo sounder system (Kongsberg EM302, M/V Fugro Equator), and they mapped much smaller areas with 12 kHz systems, which can reach the deeper ocean floor (Kongsberg EM122, M/V Fugro Supporter; Reson SeaBat 8150, Chinese PLA Navy ship Zhu Kezhen). Here we highlight three examples from this shipboard multibeam echo sounder dataset that are helping to illuminate the geologic development of this portion of the Indian Ocean. Broken Ridge and the Kerguelen Plateau formed mostly as a contiguous large igneous province in Cretaceous time . They subsequently experienced rifting and were eventually separated by seafloor spreading along the Southeast Indian Ridge (SEIR) 43-million years ago . The southern flank of Broken Ridge, known as the Diamantina Escarpment, documents the rifting, plunging more than 5100 m from its crest (638 m of water depth) into a deep trough (5800 m of water depth). This rifted flank includes escarpments rising more than 1000 m above the ocean floor, slopes as steep as 67°, and fault blocks about 12 by 25 km in size and rising more than 1200 m above their base (Fig. 2). Fig. 4: Multibeam echo sounder bathymetry map of two regions of the ocean floor around the Geelvinck Fracture Zone in the Australian-Antarctic Basin south of Broken Ridge (see Fig. 1 for locations). The fracture zone offsets the SEIR by about 310 km (Fig. 1, inset). The right-lateral transform fault motion (a person standing on one side of the fault would see the opposite side displaced to the right) that created this fracture zone was mostly horizontal. Note the fracture zone fault valleys, mid-ocean ridge spreading fabric, and isolated volcanoes. The new multibeam echo sounder data, integrated with pre-existing seismic reflection and drilling data, illuminate exposed igneous basement rock, prerift sedimentary sections, and overlying sediment that accumulated on the ocean floor during (hemipelagic sediment) and after (pelagic sediment) rifting. The morphology and seismic stratigraphy of the Diamantina Escarpment indicate that the mode of rifting resembled an orthogonal rift model, in which faults develop parallel to the axis of spreading. Between the faults, a series of elongated blocks of crustal material, grabens, steps down into a deep trough and abuts the spreading ridge volcanics . North of its rifted southern flank, Broken Ridge generally has subtle relief, with igneous basement rocks overlain by sedimentary rock and pelagic sediment, e.g. Coffin . In places, slides and debris flows have reworked sediment downslope. A large depression, about 90 km in diameter and with about 500 m of relief, lies some 70 km northeast of the crest of Broken Ridge (Fig. 3). Numerous crosscutting retrogressive slides (where the collapsing area extends progressively higher up the slope) and debris flows dissect the flanks of the depression, recording episodes of sediment flow, with slide scarps as much as 180 m high and 10 km wide and debris fans more than 150 km long. South of Broken Ridge, normal oceanic crust of the Australian-Antarctic Basin has formed along the SEIR at intermediate spreading rates of 59 to 75 mm per year [9, 3]. The shipboard multibeam echo sounder data swath traverses a region of crust north of the SEIR that is some 10 to 40-million years old, obliquely cutting across tectonic seafloor spreading fabric consisting of elongated abyssal ridges and fracture zones (Fig. 1). Oceanic crust in this region, which lies in water depths of 2200 to 5000 m, is characterised by SEIR and paleo-SEIR segments some 200 to 500 km long (Fig. 1) . In the search area, fracture zone valleys are as much as 900 m deep and 12 km wide. The abyssal ridges have as much as 200 m of relief and are more than 70 km long (Fig. 4). Discontinuities along the paleo-SEIR not associated with transform faults and more than 150 sea knolls and seamounts are also common (Fig. 4). Volcanoes occur in isolation and in chains, forming semiconcentric structures, some as high as 1500 m, with diameters of about 500 m to more than 15 km and slopes of about 10° to 30°. Fig. 5: One by-product of the search for the missing Malaysian Airlines flight MH370 is a view with an unprecedented level of detail of the landscape deep in the Indian Ocean. This 3D image shows the Diamantina Escarpment, looking northwest (upslope). The largest seamount in this area, about 1,5 km high, appears in the foreground. In the middle and background, the escarpment and trough mark the northern margin of the rift. Vertical exaggeration is three times. Credit: Kim Picard and Jonah Sullivan. 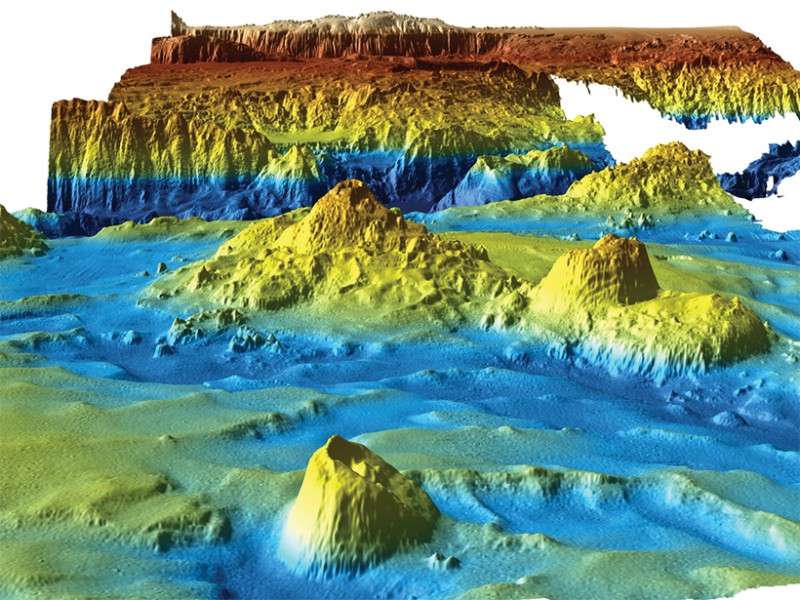 The new data highlights the topographic complexity of the ocean floor and provided a framework for deploying deepwater instruments in the search for the MH370 wreckage. The data also revealed details of the tectonic, sedimentary, and volcanic processes that formed this region of the ocean (see Fig. 5). This effort demonstrates the breadth and depth of knowledge that will be gained as the remaining 85% to 90% of the global ocean is mapped at similar resolution. This article was first published in Eos, 98 on 6 March 2017 under the Creative Commons CC BY 2.0 license and is republished here with permission. 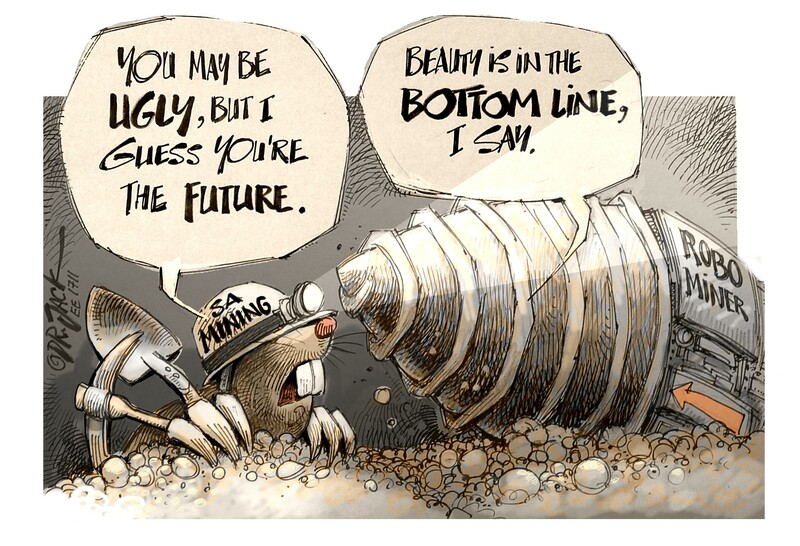 We thank the Geoscience Australia team, especially Tanya Whiteway and Maggie Tran, for project management; Maggie Tran, Justy Siwabessy, Michele Spinoccia, Jonah Sullivan, and Jonathan Weales for data processing and mapping; and Silvio Mezzomo and David Arnold for the figures. We are thankful for insightful reviews by Scott Nichol and Ron Hackney of Geoscience Austrialia and two anonymous reviewers. The search for MH370 was managed by the Australian Transport Safety Bureau and the Joint Agency Coordination Centre for the Malaysian government. We thank the Fugro Survey team from Perth, Australia, and the masters and crews of M/V Fugro Equator, M/V Fugro Supporter, and Zhu Kezhen for shipboard multibeam echo sounder data acquisition. 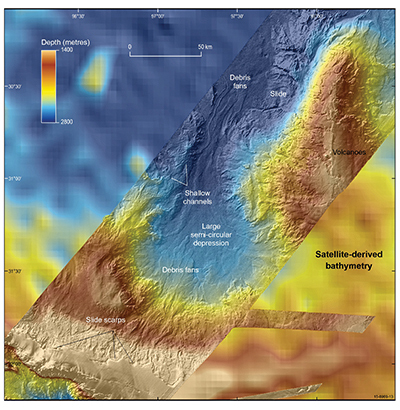 DT Sandwell, RD Müller, and WHF Smith: New global marine gravity model from Cryo-Sat-2 and Jason-1 reveals buried tectonic structure, Science, 346, 65–67, 2014. https://doi.org/10.1126/science.1258213. DF Argus, RG Gordon, and C DeMets: Geologically current motion of 56 plates relative to the no net rotation reference frame, Geochem. Geophys. 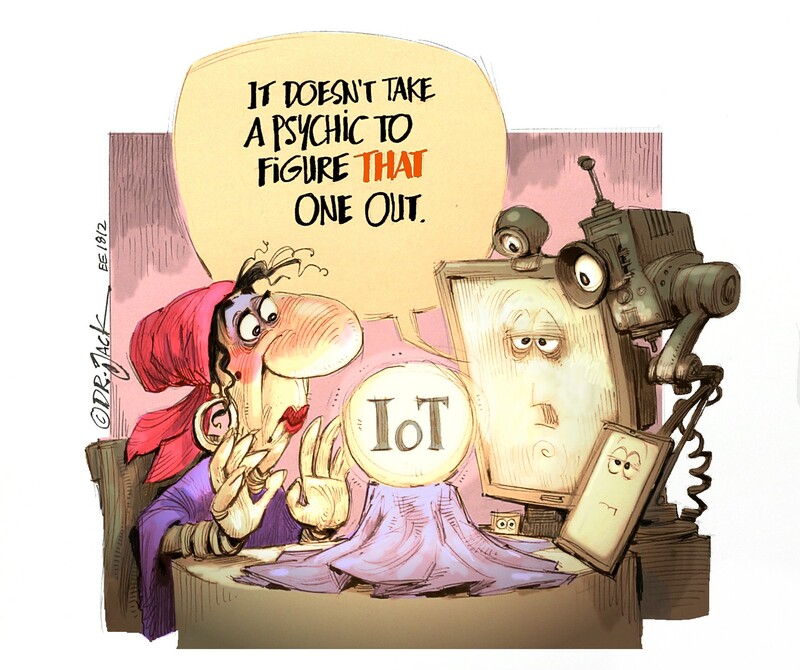 Geosyst., 12, Q11001, 2011. https://doi.org/10.1029/2011GC003751. RD Müller, M Sdrolias, C Gaina and WR Roest: Age, spreading rates, and spreading asymmetry of the world’s ocean crust, Geochem. Geophys. Geosyst., 9, Q04006, 2008. https://doi.org/10.1029/2007GC001743. P Weatherall, KM Marks, and M Jakobsson: A new digital bathymetric model of the world’s oceans, Earth Space Sci., 2, 331–345, 2015. https://doi.org/10.1002/2015EA000107. JT Copley: Just how little do we know about the ocean floor?, Conversation, 9 Oct. 2014, http://theconversation.com/just-how-little-do-we-know-about-the-ocean-floor-32751. MF Coffin, FA Frey, and PJ Wallace: Proceedings of the Ocean Drilling Program, Initial Reports, vol. 183, 101 pp. 2000. Ocean Drill. Program, College Station, Texas. JC Mutter and SC Cande: The early opening between Broken Ridge and the Kerguelen Plateau, Earth Planet. Sci. Lett., 65, 369–376, 1983. https://doi.org/10.1016/0012-821X(83)90174-7. GD Karner and NW Driscoll: Rift flank topography and extensional basin architecture: Formation of Broken Ridge, southeast Indian Ocean, An. Acad. Bras. Cienc., 65, suppl. 2, 263–294, 1993. CSmall, JR Cochran, JC Sempéré, and D Christie: The structure and segmentation of the Southeast Indian Ridge, Mar. Geol., 161, 1–12, 1999. https://doi.org/10.1016/S0025-3227(99)00051-1.